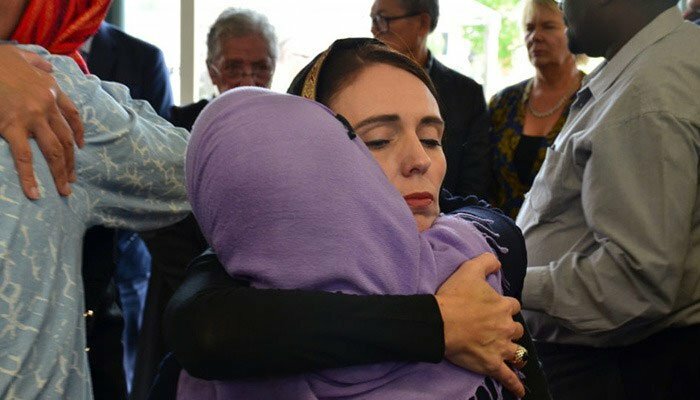 LOS ANGELES,CA, ( 3/17/19) — New Zealand Prime Minister Jacinda Ardern, who was wearing hijab, Saturday visited families of Christchurch terror attack victims and her expression of solidarity with Muslims in this hour of grief was well received. Attacks on the two Christchurch mosques left 50 dead Friday, with one gunman — identified as an Australian extremist — apparently livestreaming the assault that triggered the lockdown of the New Zealand city. In what appeared to be the worst attack against Muslims in a western country, witnesses spoke of victims being shot at close range, with women and children among those killed. The New Zealand premier was showered with immense praises internationally for the gesture, which made it clear that New Zealand stood by the Muslim community that was the center of Friday's horrifying terror attacks rooted in racial as well as religious hatred. Speaking to reporters later, Ardern said the country’s gun laws will change in the aftermath of the attack on Christchurch mosques by Brendon Terrant, the Aurtralia-born terrorist behind the carnage. She said Tarrant, who has been arrested and charged with murder and committing a terrorist act, had allegedly used five firearms, including two semi-automatic weapons, two shotguns and a lever-action firearm. The New Zealand premier said that he had been in possession of a "Category A" gun licence obtained in 2017. This, according to her, allowed the Australian terrorist to legally obtain the weapons in December 2017, and that he was not on any watch-lists prior to the attacks. "While work has been done as to the chain of events that led to both the holding of this gun licence and the possession of these weapons, I can tell you one thing right now: our gun laws will change," Ardern told reporters. She said attempts had been made to change New Zealand's [gun] laws in 2005, 2012 and in 2017 following an inquiry. "Now is the time for change. There are obviously questions being asked of how this person was able to enter the country and undertake this act of terror," the premier said.